Fighting defective lock of a safety door is what everyone considers doing when it stops working for the first time. 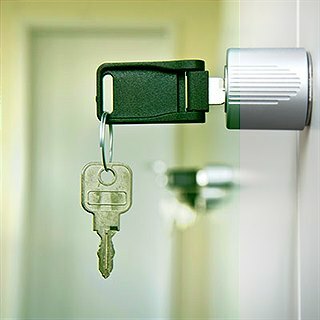 But, what if the problem persists, forcing you to call the mobile locksmith every single time? It is wiser to have it replaced instead so as to limit your overall security expenses. As is common with all mechanical objects, locks too have expiry dates. Replacing them not only gives you the reassurance of unmitigated home security, but also allows you to try out the latest technology in the market. The security sector is something that is continuously updating. Every day, there are newer products of different types and technologies in the market, which are better and advanced than their traditional counterparts. Searching for the right security door lock in such a scenario can be demanding. In order to help you find the best locks for you, we have created this short list of five top brands. They are known for employing cutting edge technology in their security products. Founded in 1920, Schlage is one of the pioneers in residential security. Some of their best-selling types are keypad-based, wireless, touchscreen- Bluetooth-enabled, and cylinder locks. Their latest series of keyless security systems has been a favorite among our customers in Mundelein. Around since 1946, Kwikset boasts of as a complete residential security lock manufacturer. In addition to systems for security doors, they also make handle sets, deadbolts, knobs, and other home accessories. One of their main products is the Smartkey rekey technology where users can themselves rekey their locks without having to remove them from the door. In its seven-decade history, Baldwin’s hardware has adorned the doors of every other household in America. Compared to other brands, Baldwin is known for their beautiful designs which appeal to a larger crowd. After all, looks are also important. Some of their best products are 8000 series deadbolts, 5600 series rim type, and the newest Zigbee keyless entry systems. Weslock is known for its beautiful collections of security door locks and accessories with warranty programs ranging from twelve months to ten years. Their Molten Bronze and Elegance collections, which provide complete solutions to residential as well as commercial buildings, have many takers around the country. Assa Abloy is the largest lock manufacturing company in the world, and Emtek is its sister concern. Founded in 1981, the latter deals in electronic fasteners, mortise and tubular entry sets, cabinet clasps, and side plate bolts. Locksmith Mundelein works with all of these brands and more. Call today for more information or service.